A 21-burger salute to Heart Attack Grill spokesman Blair River. 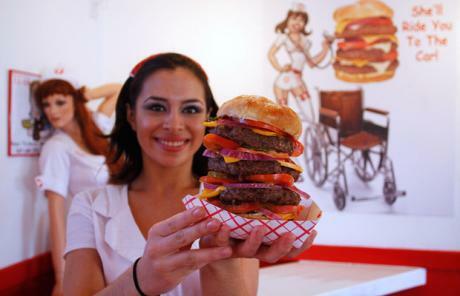 The Heart Attack Grill, an unusual restaurant in Chandler, Arizona, was famous for two things. First of all, it had some of the worst food imaginable, in terms of health content. We’re talking burgers that weigh in at several pounds, with multiple massive patties and globs of deliciously unhealthy condiments on top. Second of all, it had an unusual spokesman, a 575-pound, 6’8 man named Blair River. I say had, because 575-pound Heart Attack Grill spokesman Blair River has passed away at the age of 29. To honor that request, I won’t make any joking remarks about Blair’s death (especially since I’m the same age). The death of an otherwise nice person is seldom funny, and when it’s obvious that the gentleman in question had a lot of health problems at a very young age, that makes it doubly tragic. I wonder if Jon Basso is regretting making River a spokesman for his restaurant, or opening the restaurant in general. Surely he feels some guilt given that his restaurant didn’t exactly help Blair live a healthy lifestyle. Given that anyone over 350 pounds eats free, I foresee a lot more tragic deaths in the future of the Heart Attack Grill.